This module should take you 18-24 minutes to complete. Create a communication plan in order to promote and gain support for digital learning in your afterschool program across varied audiences. What is our program’s current communication plan? How can promoting digital learning support our program? Why do we want to promote digital learning and technology in our program? Your program may already have a well-thought-out communication plan that includes messaging tailored to different audiences. If this is the case, creating a plan to promote digital learning in your program can not only help you gain support for digital learning, but it may also help create more support for and interest in your program! Understand the importance of creating an effective communication plan to promote digital learning in your program. Learn the process for incorporating language about digital learning and technology into your current communication plan. Identify your audiences and begin to tailor your message for each audience. >>WHAT DOES IT MEAN TO PROMOTE DIGITAL LEARNING? Promoting digital learning in or about your program means having clear and consistent messaging tailored to different audiences about how you are integrating digital learning and using technology in your program. It may also mean having a clear way to communicate why you would like to begin to incorporate digital learning into your program if you are not already doing so. >>WHY IS PROMOTING DIGITAL LEARNING IN MY PROGRAM IMPORTANT? Secure access to devices, space, staff, or funding. Recruit more students into your program. Get additional support from school-day and/or community partners. Get staff on the same page with a unified message about digital learning and technology. Celebrate and elevate your program’s accomplishments around incorporating digital learning. When starting to think about the language to include about technology and digital learning, it can be useful to create an elevator pitch. An elevator pitch is a short persuasive speech that you can use to get support for the way you incorporate technology and implement digital learning in your program. The idea is that your message is clear, concise and can be spoken in 30 seconds or less—the time it takes for your listener to ride in the elevator with you. Practice your elevator pitch and have staff practice, too. Make it fun by having a contest for who can memorize it the best or say it the fastest. It’s important that everyone can give the elevator pitch with ease—because you never know who you might meet! It could be someone who wants to support your program. Since 2001, the Long Beach YMCA Youth Institute (YI) has been improving the lives and academic outcomes of adolescents in the Long Beach, CA community. 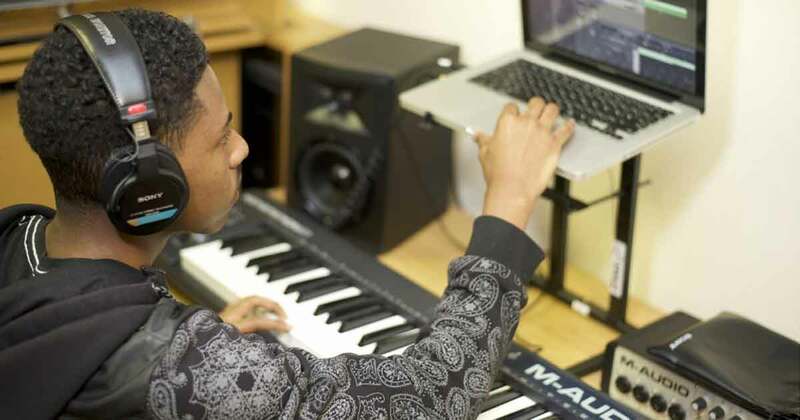 The Youth Institute uses technology as an integral mechanism for promoting positive youth development and developing pathways to post-secondary education and career readiness of low-income, culturally diverse urban high school youth. Youth Institute alumni have well-documented success stories. This program is often cited in grant applications for technology programs and the founder, Bob Cabeza, frequently uses opportunities as keynote speaker at educational conferences to elevate the visibility of the program. A large part of this program’s success can be attributed to clear and careful planning. As a requirement of an early partnership with Apple, YI staff had to create a pitch session on how the program would be marketed to parents and potential partners. The YI staff and representatives from Apple met over the course of a two-day retreat to plan their pitch and business model. It took approximately a dozen revisions until they narrowed their focus into a streamlined narrative that quickly got to the point of their mission. Because of the popularity of this program, the biggest advocate for the Youth Institute is the student body itself. In many ways, students have their own pitch. The highest recruitment for new members comes from friends who are already in the program. There is intentionality with which students are accepted into the program. Students must receive recommendations from their peers, school counselors, and teachers. In addition, there is planned racial and ethnic diversity, and because of a disparity in gender throughout the tech industry, student recruitment is equally female and male. For recruiting partnerships, however, the YI staff still rely on their trusted elevator pitch. By being able to quickly get to the point, they have developed partnerships with 15 foundations. These partnerships vary from general funding initiatives to small, specific projects. Clear and concise goals, objectives, and data-proven methods all work toward keeping this program both up and running and evolving. Mr. Cabeza’s advice for those looking to bring more technology into their programs is to “think big, buy small.” He suggests to have an intended outcome that is about more than technology and bring the technology in gradually, teaching what is reasonable and immediately usable, while remembering that your goal is about students more than it is about technology. 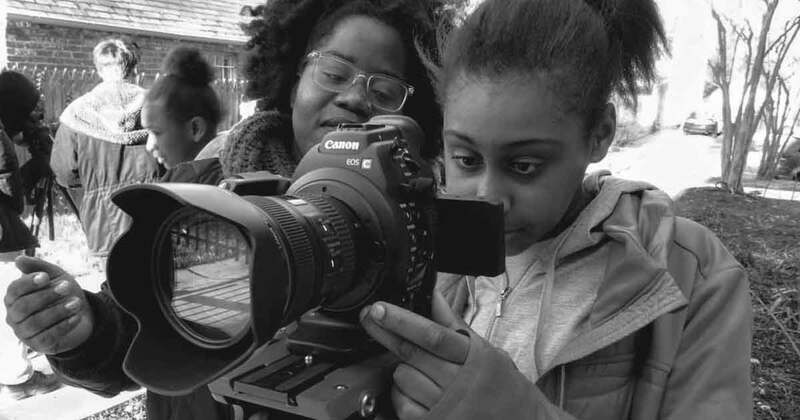 Wide Angle Youth Media (WAYM) has produced hundreds of media projects with students since their start in 2000. Their mission grew organically, evolving to meet the needs of the Baltimore, MD community. What started as a way to help young people tell their stories became a way to expose teenagers to new career possibilities in technology fields with training and paths to certification, to assist older students with the transition to the workforce or college, and to continue with broader goals such as building communication skills, providing adult mentoring, and of course, storytelling. At its heart, WAYM is about storytelling. Their elevator pitch is a story told in many ways by many people about why this program is special. Staff, students, board members, parents, mentors, etc., all have something to say about Wide Angle. To help these varied speakers communicate with diverse audiences, the Marketing and Communications department, along with staff and board members, developed an Elevator Pitch toolkit instead of a singular elevator pitch. Usually, WAYM lets student work speak for itself, but sometimes a few quick words can open doors to sharing that work. Their toolkit asks the person giving the pitch to think about a few core questions and how they would tailor them to fit a particular audience. First, identify the audience and what the goals are in approaching the audience. Then, put enthusiasm to work and tell the story of your involvement. Explain what the organization does by becoming familiar with the mission statement. Highlight the successes. What are the selling points? Circle back to your story of involvement, and tie everything together. Answer any follow-up questions and be prepared to collect a business card or get contact information. Finally, express gratitude and share information and connections. The WAYM Elevator Pitch toolkit breaks down these questions. If you have a communication plan to promote and/or garner support for your program or organization, then you are probably already familiar with the following steps. This process will help you hone in on specific language to promote your efforts around integrating digital learning and utilizing technology. 1. Establish your purpose and goals. 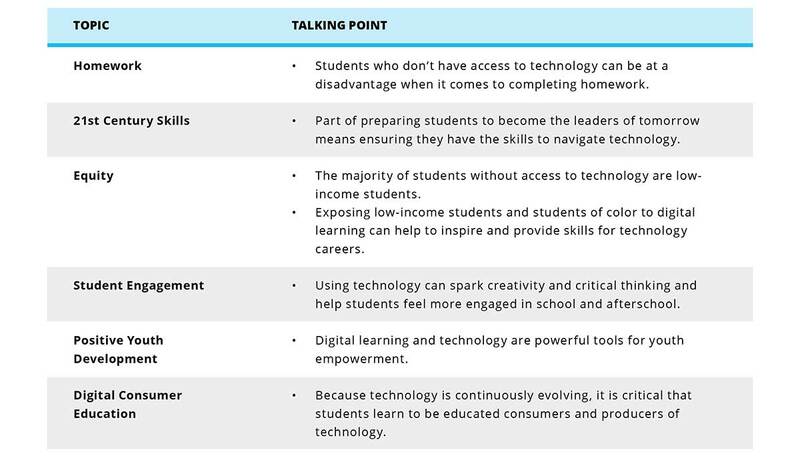 What do we want to accomplish with our communication about technology and digital learning? What kind of support are we looking for and from whom? By reflecting on these questions, you will notice that you may have different goals for different audiences. This is OK. These goals will guide you in crafting the best message for each audience. For example, you may be seeking financial support from businesses and foundations in order to purchase devices. Perhaps you are looking for tech-savvy volunteers to help incorporate digital learning activities into your program’s offerings. As you establish your goals for promoting digital learning, be clear about the goals you have for different audiences. Clear goals will help you create specific language for each audience. Think about who you want to reach and why. This will help you determine what information is most relevant, what tone to use, and the most effective medium for communication. The following chart shows examples of audiences you may want to reach and the goal for promoting digital learning in your program to that audience. 3. Gather research, data, and information. If you are trying to reach families who may be apprehensive about technology, consider highlighting the importance of 21st Century skills for college readiness and workforce success. Also, include ways you use technology to support positive youth development practices. As you begin to craft your communication plan around digital learning for your program, here are some talking points you may find useful. Now that you have a goal, know your target audience, and have compiled talking points and research points, it’s time to create your message. Your message should be different from your elevator pitch. Your message should include all the talking points you want to get across and should not be restricted by time or length. As you craft your message, realize that some people have a negative reaction to the idea of students interacting with technology. Students and technology can be perceived as a distraction or as something that may lead to cyber bullying. While these concerns are valid, it is important to emphasize the skill-building aspect of your work and stress the fact that the technology use and digital learning that takes place in your program is conducted in a safe and supportive environment. 5. Determine how you will deliver your message. Should we set up in-person meetings? What social media platform would be most effective to deliver our message? Remember that infusing some levity and youth voice into your communication is also great. So, let your inner poet come out! Ask youth to give their insights about technology and digital learning and write a post about it. Post photos of your digital learning programming in action. Use social media to continue to engage your audiences and help them understand why digital learning is so important to your students. Should we organize family or community meetings? 6. Assess how your message is being received. After your communication plan to promote digital learning in your program is well underway, it is important to assess whether you are reaching your audience with the message you created. Evaluate how well you are meeting your goals. This will help you determine whether you need to tweak your message. Have we secured more funding for devices or other technology? Have any new opportunities for the program surfaced since we launched our new communication efforts? Has student recruitment increased as a result of new messaging around digital learning and technology? Have we developed new partnerships as a result of messaging about technology and digital learning? Have we obtained more or better access to technology and digital learning from our school day, community, or business partners as a result of our messaging about digital learning and technology? Consider what you have learned in this module, and start planning your communication to promote digital learning. Use the following questions to get you started. What can we do as a first step to start promoting digital learning in our program? Who possesses communications skills to support our program in creating a digital learning and technology communication plan? How can my team be meaningfully involved in this process? The Afterschool Alliance offers tools to create a comprehensive communication strategy for your afterschool program. Afterschool STEM Hub was developed by the Afterschool Alliance and the FrameWorks Institute to specifically support afterschool programs in communicating about STEM. Continue learning with the next module of the Toolkit. Share your thoughts and participate in community chats on Twitter by using the hashtag #AfterschoolTech. Join our mailing list to stay up-to-date on new module releases and training events. Please help us collect feedback that is so important to this initiative. The survey will take just a few minutes, but will provide us with valuable data. Your feedback is greatly appreciated.